NEW YORK (TheStreet) -- Wheat prices took a dive Friday as violent unrest rocking the world's biggest wheat importer sent tremors through the market. Wheat prices for March delivery, the most active contract, fell 20.4 cents to $8.25 1/6 a bushel from $8.46 ½ a bushel Friday. The tumble in wheat prices Friday follows strong wheat price levels exhibited over the last few weeks as sovereign nations stocked up on the grain in reaction to fears of growing civil unrest sparked by rising food and energy costs. On Wednesday, Algeria bought 800,000 metric tons of wheat, compared with its purchase of up to 600,000 metric tons of wheat several weeks ago, as food riots broke out in the Middle East and North Africa. Big purchases such as this one had fueled a bullish tone in the grain market but this dissipated when riots escalated to new levels in Egypt, where mobs of angry demonstrators threatened to topple the long-reigning authoritarian president Hosni Mubarak. 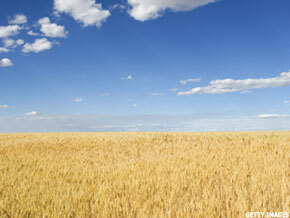 PFG analyst Phil Flynn said the bullish play on wheat was erased on Friday. "Egypt, the major wheat importer, is in turmoil," said Flynn. "Are they going to import wheat? Are they going to have a government Monday?" Meantime, the U.S. Department of Agriculture had estimated that the country would be buying 9.8 million metric tons of wheat for the one-year period concluding at the end of June. That's almost 60% greater than the amount that Brazil, the second largest wheat importer, would be buying, according to estimates. The United States is the world's no. 1 wheat exporter. Soybeans, by comparison, registered a much lower drop than wheat. Soybeans were just 1 ¼ lower to $13.98 a bushel from $13.99 ¼ -- its softer landing was rendered possible with a big purchase last week. Corresponding with Chinese president Hu Jintao's visit to Washington last week, a delegation of Chinese soybean buyers agreed to buy a record $6.68 billion worth of U.S. soybeans. "Beans have been strong this week," Flynn noted. Food stocks were mixed in Friday's trading session. China Marine Food Group ( CMFO fell 3.1% to $4.06 and AgFeed Industries ( FEED was lower by 2.4% to $2.48 as American Lorain ( ALN rose 0.4% to $2.75.